Windshield replacement for your car windshield or truck windshield is best managed by a qualified auto glass installer. When your automotive window has been damaged by flying rocks, or flying stones, the eventual result could be a crack across the windshield which restricts your line of vision when driving. Many states will actually ticket drivers with crack damage that restricts or blocks the driver's vision. 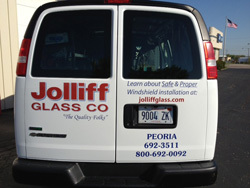 Jolliff Glass has trained auto glass installers who will travel to your home, business, or place of work with our mobile auto glass replacement vehicles, or you may wish to schedule an in-shop appointment at our facility. During wet, rainy, or cold weather conditions, it is necessary to perform installations indoors. We offer pre-scheduled hourly appointments throughout each day, and have available a spacious and comfortable waiting room. This tempering process makes the glass up to ten times stronger than non-tempered glass of the same thickness. Tempered Glass (door glass, back glass, etc.) has been "tempered"...put through a special process where it is heated, then rapidly cooled. This tempering process makes the glass up to ten times stronger than non-tempered glass of the same thickness. Tempered glass doesn't shatter on impact. Rather, it disintegrates into dull-edged pieces, almost like pebbles. There are no large, jagged pieces of glass to injure the driver or passengers.